New Harvard-led research indicates that cases of breast cancer diagnosed after a negative screening mammogram were more likely to be associated with poor prognosis than those cancers diagnosed after a positive screening mammogram. The findings were based on a review and analysis of mammography data for more than 300,000 women and published in JAMA Oncology. 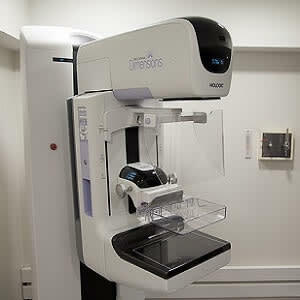 "The rate of breast cancer after negative mammography results is small but the likelihood these cases can be associated with poor prognosis highlights the need for early detection," write Anne Marie McCarthy, PhD, Department of Medicine, Massachusetts General Hospital and Harvard Medical School in Boston, and co-authors. Approximately 15 percent of breast cancers are diagnosed after the patient undergoes screening mammography with negative results and before the next recommended screening examination. These interval cancers (cases of cancer diagnosed during the interval between examinations) include both cancers that were present during screening mammography but were missed on examination and rapidly growing cancers that present symptomatically and tend to have a poorer prognosis than cancers detected during screening. McCarthy and collegues conducted this observational study to determine the incidence of and risk factors associated with breast cancer with a poor prognosis after screening mammography with negative findings. Mammography data were obtained from the Population-Based Research Optimising Screening Through Personalised Regimens (PROSPR) consortium. The study population (n = 306,028) included women 40 years or older with no earlier diagnosis of breast cancer who received screenng mammography between 2011 and 2014. 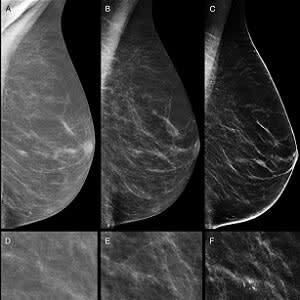 Mammograms with negative results were those with an initial Breast Imaging Reportng and Data System category 1 or 2; mammograms in all other categories were classified as having positive results. Cancer diagnoses within one year after screening mammography were obtained from state cancer registries. Breast cancer cases with a poor prognosis were defined as those meeting any of the following criteria: distant metastases; cancer-positive regional lymph nodes; estrogen receptor-positive and/or progesterone receptor-positive and HER2-negative invasive cancer 2 cm or more in diameter; estrogen receptor-negative, progesterone receptor-negative; HER2-negative (triple-negative) invasive cancer 1 cm or more in diameter; or HER2-positive cancer 1 cm or more in diameter. The results show that cases of cancer diagnosed after screening mammography with negative results were more likely to be associated with a poor prognosis (43.8 percent) than those diagnosed after mammography with positive results (26.9 percent). 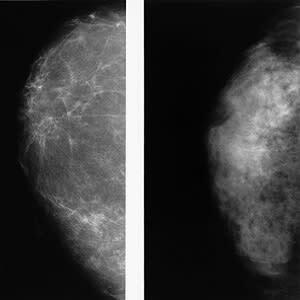 Among all women with a negative mammogram, women with dense breasts had twice the odds of receiving a cancer diagnosis (irrespective of prognosis) with women with nondense breasts. Age and family histor were not significantly associated with breast cancer diagnosis after negative mammography results. "However, among women who received a diagnosis of cancer after negative mammography results, younger age was associated with having cancer with a poor prognosis," the authors note. "Breast density and family history were not significantly associated with poor prognosis."